Dancers Unite is the place in Charlotte to go to for competition dance. 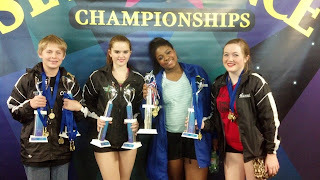 We are the only dance academy in Charlotte to offer both Dance Competition Company Teams as well as All Star Team options that compete in both dance and cheerleading competitions. In other words, we have teams for everyone! Dancers Unite have teams that are ranked nationally: Our All Star Pom Squad placed 3rd nationally and our Youth Jazz & Senior Jazz Teams placed 1st nationally! We have also won numerous high score & first place awards in hip hop, tap, lyrical, acro, musical theater and contemporary. For more information on our wins, please see our Dance Studio Awards Page. Our wins & accomplishments have also been well documented in local & national news outlets. For more information on our appearances in the news, please see our Dance Studio News Page. For more information on how you can join our Nationally Ranked Competition Teams, please see our Competition Dance Page.